Dutch painter (original name Theodor Baburen) who was a leading member of the Utrecht school, which was influenced by the dramatic chiaroscuro style of the Italian painter Caravaggio. After studying painting with a portraitist and history painter in Utrecht, Baburen traveled to Rome about 1612. His most important Italian commission was the decoration of a chapel in the Church of San Pietro in Montorio, Rome (1615-20), which included his Entombment (1617). In 1620 Baburen returned to Utrecht, where he shared a studio with Hendrick Terbrugghen in about 1622-23. The influence of Caravaggio may be seen in his Christ Crowned with Thorns (two versions, at the Franciscan House, Weert, Netherlands, and at Drury-Lowe Collection, Locko Park, England), based on a lost painting by the master. 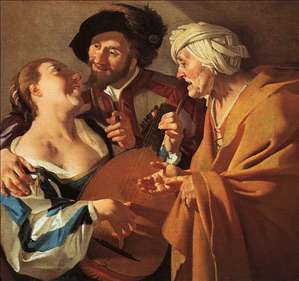 Baburen was especially fond of genre scenes (subjects from everyday life), such as The Procuress (1622; Museum of Fine Arts, Boston). A certain coarseness in conception, irregular compositional rhythms, and less atmospheric quality distinguish Baburen s art from that of his greater contemporaries, but his manner of painting can be said to be broad and forceful. 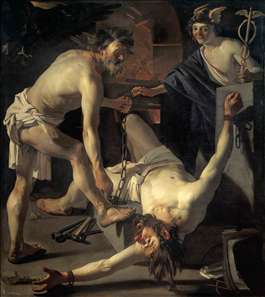 See more details about "The Procuress"
See more details about "Prometheus Being Chained by Vulcan"